About this object A three term Speaker of the House, Nicholas Longworth of Ohio began his House career in 1903. Republican congressional majorities weakened after the 1926 elections. The 70th Congress (1927–1929) tackled a number of natural resources initiatives: flood control along the Mississippi River; a survey of national forest reserves; and a dam project along the Colorado River. President Calvin Coolidge again vetoed the McNary—Haugen farm-subsidy bill and later pocket vetoed a bill to complete a major government power facility at Muscle Shoals, Alabama, in the Tennessee Valley. The House of Representatives voted to approve H.J. Res. 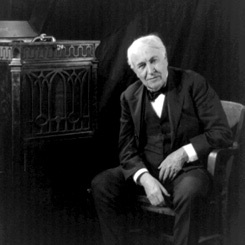 243, awarding inventor Thomas A. Edison a Congressional Gold Medal. 1Elected Sunday March 3, 1929. 2Died in office, November 19, 1928. 3Resigned February 1, 1927. See, Washington Post, February 1, 1927: 4. 4Appointed due to Fess' retirement. See, Washington Post, February 1, 1927: 4.